Thanks tSCc, this looks like a great disc to have for an Atari Jaguar fan! :-) I can't wait for my slow connection to finish downloading it, so I can check it out. Keep up the good work! 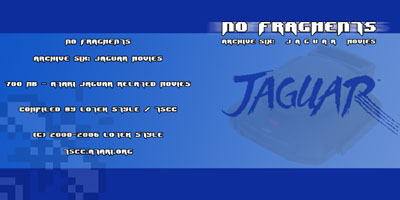 Just finished downloading this Jaguar Movies Archive and burned the iso to CD. There are several very cool Jag movies I haven't seen before. I would recommend this release for all Jaguar fans. Thanks tSCc!!!!!!! page created in 0.014520 seconds with 15 queries.